A press release today might not be what it used to in the past. Today, the PR departments tends to think that changing the wall color from bisque to soothing crème fraise needs to be broadcasted via a media release. Publishing a press release of that kind is an utter waste – you will get what you give and that’s fluff. Don’t expect great press or links from such a loosely held PR strategy. Here are some PR disasters that spell bad PR in 72, Bold, All Caps. Why it’s bad: The headline is so convoluted it is hard to tell what is the message being conveyed. Not only is it a long-winding 22 words, it is not newsworthy. And what about the big news in the first paragraph? There is an online seller who claims “young women look to their favorite celebrities to get some ideas for the perfect gown.” This is really original – of course no one knew that. How to avoid it: Your headline is what can make or break your story. 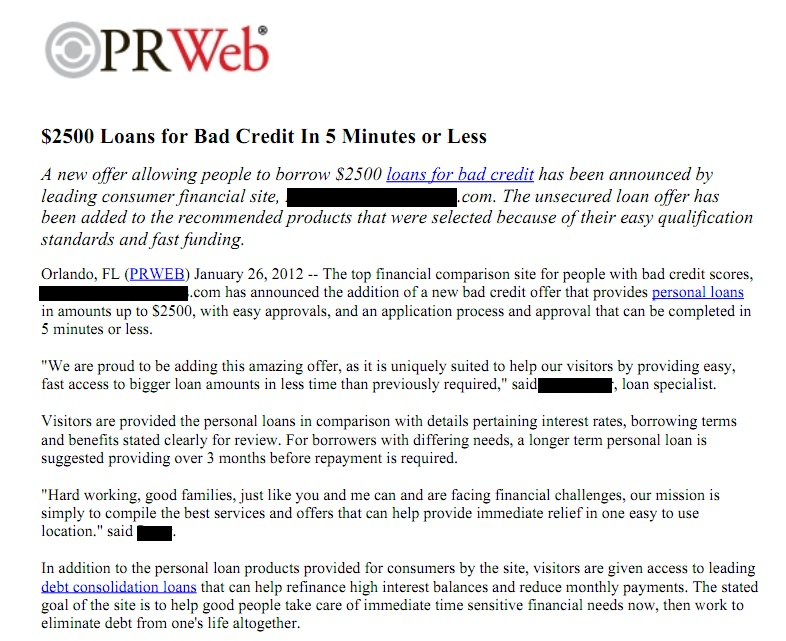 It is the sole reason someone will click on and continue to read your press release. The principal point of PR – have some real news that people want to know about. Why it’s bad: This is clear as day that this press release is nothing but a shameless gambit for SEO purposes to get more people to link to them with the indiscriminate use of targeted keywords. The writing is very unclear, the quotes add no depth, and the passive voice all over the place will make English teachers do a facepalm. How to avoid it: If you are on a link baiting trip, this is the most brazen way to go about it. However, if you are hoping to get some traction like social shares, press coverage or online mentions – it is going to take quite a bit of work to get that. 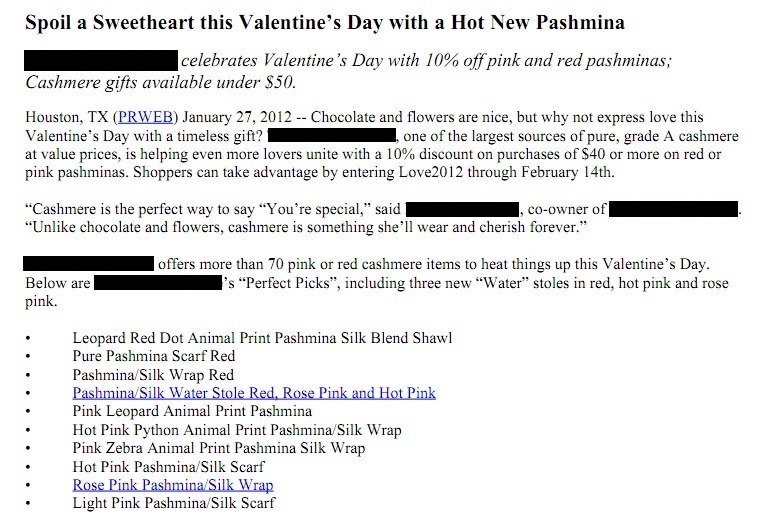 Why it’s bad: Even if we ignore the unabashed sales pitch and the bad grammar, this press release lists all the possible Pashmina shawls on the inventory is just too much. The retailer could be having a Pashmina sale. Big whoop. People reading a press release don’t wish to know the specific names of your products. How to avoid it: Every bit of information that goes onto your press release needs to be scrutinized carefully in order to avoid PR disasters form happening. If there is no clear reason to do something, simply don’t.